Dr Nick was a gentle, loving person. Of many who came to his doorstep searching for help and advice, he gave special attention to students, especially those experiencing financial needs. Dr Nick knew all too well what it meant to be a poor student, to sleep on the floor in a friend’s room when there was no money to afford paying rent, and to sleep on an empty stomach on more than one occasion, and yet to excel in school and finish among the top of your class. This was the kind of love Dr Nick had and was known for, marking his whole life and living a dent in the world. 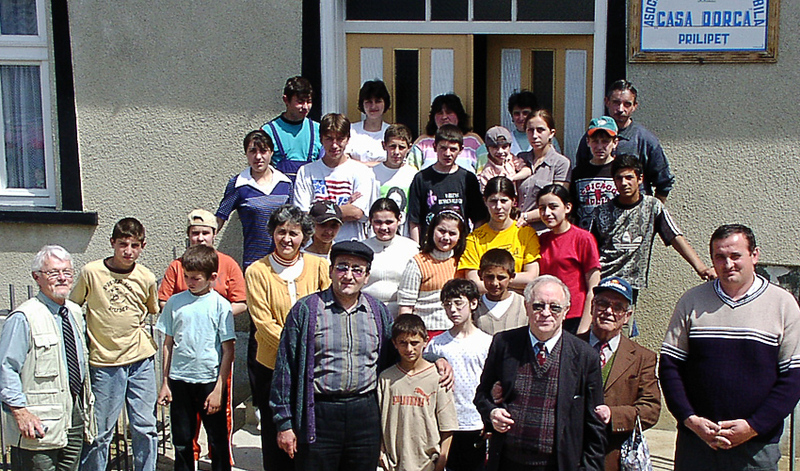 Dr. Nick (center) with Bill Bathman (right) and fellow Romanian pastor, Paul Negroot (left). While a student in the university, a young man in Nick and Cornelia's church lost his father to cancer. He was in his third year of studies, and the family was not well-to-do. Besides this, the father was the main breadwinner in the family, and he had three other siblings. After the funeral, the couple decided to give him a monthly allowance from that moment and until he finished his studies. Even though this happened some 20 years ago, to this day, he remembers the help he got without which it would have been much harder to complete his degree, maybe even impossible. Dr. Nick's compassion for the hurting led to the existence of ITMI project, Casa Dorca Orphanage. Dr Nick mentored a young theology student who was studying in the Seminary in Bucharest in mid-90’s. At that time, Dr Nick was the General Secretary of the Romanian Baptist Union and living in Bucharest part of the month, and his studio apartment was in the same building as the dorm which housed the students. Dr. Nick advised the theology student many times, and helped financially as the need arose. Upon graduation, this theology student became a pastor in a church in North East Romania, and would visit Dr Nick in Oradea from time to time. The pastor relates the envelope had a sum of money which was exactly the sum needed for the down payment on a piece of land he was looking to buy for ministry. To this day his eyes light up when he shares the story of how the Lord “whispered” to Dr Nick about this need. Dr. Nick preached passionately about Jesus from the pulpit and with his life. When in the US during the early 70’s, working at a clinic in Baltimore, Dr Nick was offered a job with a generous monthly salary. Almost on the spot he refused, saying his family (wife Cornelia, daughter Corina and son Radu – Ema had not been born yet) was more important to him. He went on to say that staying away from them for a longer period of time (due to the Communist regime in Romania at that time, the family would not have been able to join him right away) was not what he desired, despite the benefits of the job. Throughout his whole life he was an advocate for family values and family unity, and in his later years, he would always say to us how grateful he is to the Lord for family, for blessed family reunions, for good communication and great relationship among siblings. Dr. Nick and his wife, Cornelia, with their daughter, Ema Ban and her family. The decision to leave their home in Ukraine was a tough one. Vladamir was a lawyer. He and his wife, Julia, were raising three sons. Starting a new life somewhere else meant their sons would leave their school and their friends, for a new school in a new language. It meant Vladamir would be starting over with the career he’d worked to build. It meant they wouldn’t live in their home, the country they’d lived in all their lives. They’d be away from their people. Their family. Their friends. Onlookers Receive Christ While 32 New Believers are Baptized in South Sudan! January was an exciting month at Word of Life Church in Juba, South Sudan! These 7 photos from Adi Ban’s trip to Donbas, Ukraine reveal:How this trip is actually fruit of the ministry Adi and Ema have been faithfully doing for years with your support, three ways Adi’s team offered valuable aid, both physical and spiritual and an unexpected challenge the team faced.